Shuri becomes ruler of Wakanda and may even end up taking up the mantle of Black Panther for a while. Black Panther was a surprisingly good entry into the MCU that properly introduced viewers to the nation of Wakanda. A country is nothing without its people, however, which is why the movie focused more on the characters rather than the technology powering the elusive nation. Despite being the main character of the movie, the titular Black Panther was often eclipsed by his tech-savvy sister Shuri and the main villain Erik Killmonger. Unfortunately, (spoilers) Killmonger is out of the picture so we’re unlikely to hear about him for a while. Shuri, on the other hand, is a different matter altogether. Thanks to Bustle, news recently came out that Marvel is working on a new comic book series focused primarily on Shuri. By the sound of it, Black Panther will not be ignored completely in favor of Shuri but he will not play a major role in the upcoming series. Instead, Marvel wants to give fans more insight into Wakanda’s princess and they’re doing it in a pretty interesting – if a bit predictable – way. Black Panther gets lost in space after one of his missions goes horribly wrong so now Wakanda is left without a ruler. It’s safe to assume that he will be back at one point but in the meantime Wakanda needs to find somebody to replace him. Shuri is a tech genius which makes her more likely to choose a lab over a throne any day but these are dire circumstances so the burden falls upon her. Besides, she is next in line to rule so she doesn’t really have a choice but to step up and run the country in her brother’s absence. Duty calls and all that. Black Panther is not just T’Challa’s alias but rather a mantle that’s being passed down from generation to generation to the ruler and protector of Wakanda. What this means is that Shuri would also have to take up this mantle in order to be considered a true ruler. Marvel hasn’t revealed any details regarding this aspect but it’s not out of the question. In fact, this wouldn’t be the first time it happened. It may come as a surprise to some, but Shuri actually already took the mantle of Black Panther in the past, albeit for a brief time. This happened back in 2009 when T’Challa fell into a coma and his sister stepped up to temporarily replace him. Over the years the title of Black Panther was also held by T’Challa father, King T’Chaka, his grandfather Chanda, as well as Killmonger himself. The Black Panther spin-off series is scheduled to hit the shelves this October. 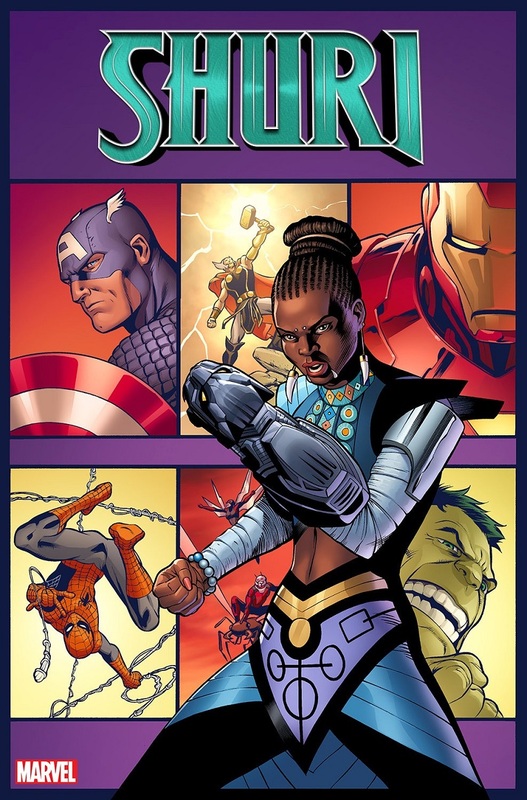 Similar to other spin-off series, Shuri will probably have a limited run (likely around six issues) but that’s enough to give fans a better understanding of what she’s all about. Other recent six-issue spin-off series include Black Panther & The Crew, Black Panther: Long Live the King, and World of Wakanda. Make sure to check them out before the new series drops in October.